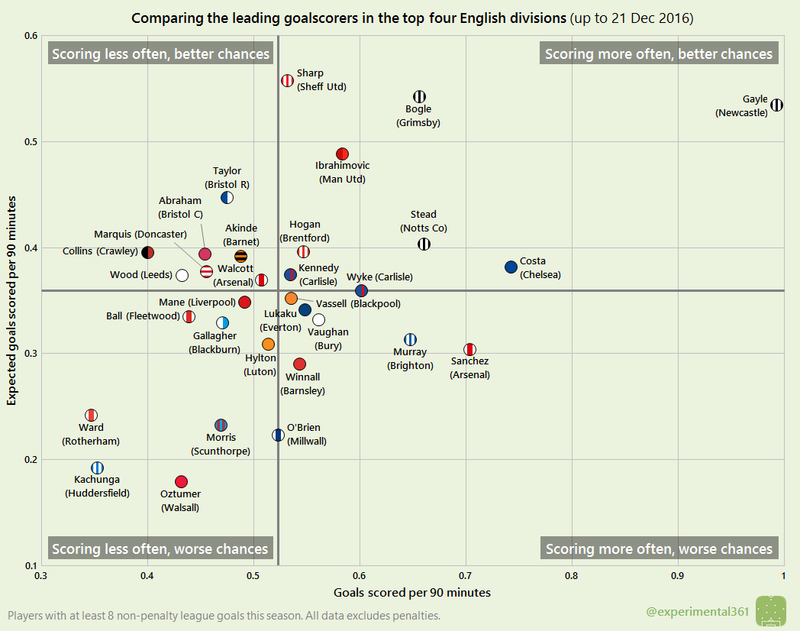 As we’re almost halfway through the season, I thought it was about time I revisited this graphic from early October comparing the leading goalscorers. What I’ve done below for each player with at least eight non-penalty league goals (chosen as a cut-off simply because it gave me a good number of players to compare) is to measure their goals scored (from left to right) and the expected goals value of quality of their shots (from top to bottom). Both are expressed as a rate per 90 minutes and I’ve divided the graphic into quadrants based on the average (median) for this group of players. Let’s start by acknowledging just how ridiculous Dwight Gayle‘s goalscoring rate is. It’s virtually a goal per game and he’s firing them in far more rapidly than anyone else: the nearest player to him in the top four divisions is Diego Costa. Given that the shots he’s taking are “worth” just a shade over half a goal per 90 minutes – i.e. far less – I’d be tempted to conclude that his scoring rate will dip as the season wears on. However he’s getting great service and is clearly the focal point of Newcastle’s attacks in a division they’re dominating, so who knows. Bristol City’s Tammy Abraham was scoring marginally more frequently than Gayle back in October but the goals have dried up for him somewhat: he’s much further over to the left now with a scoring rate much closer to the quality of chances he’s being supplied with. Similarly, in the last post I predicted that Scunthorpe’s Josh Morris would struggle to maintain his goalscoring rate and that’s proved to be the case. He was sitting on 0.7 goals per 90 minutes back in October but that’s already drifted back to below 0.5. In the bottom right, it looks like Alexis Sanchez and Glenn Murray are also scoring more rapidly that the opportunities they’re getting would suggest they should. so both are likely to make the net bulge less frequently in future. Focusing on the positive, Sheffield United’s Billy Sharp, Grimsby’s Omar Bogle have something in common with Zlatan Ibrahimovic: all three are scoring at a pretty convincing rate that could well continue. We find in general that strikers who shoot regularly tend to convert chances 5% more efficiently than the average player, with only the top 10% of finishers sustaining a long-term goalscoring rate which is more than 33% higher than their expected goals, so I can believe that this trio can continue on their current trajectories.